What’s Going On With Vehicular Travel? imagineSanAntonio is group of citizens that imagines a better future for San Antonio. We are a collaborative non-profit working with city agencies, other non-profits, and concerned citizens in order to create the great city we all imagine. See our imagineSanAntonio: About Us brochure for more information. A standing-room only crowd joined imagineSanAntonio for Dialogues In Planning: Urban Connectivity, an informed discussion on streets and the vital connections they provide in an urban setting. Thanks again to our host, the downtown campus of the University of Texas at San Antonio. 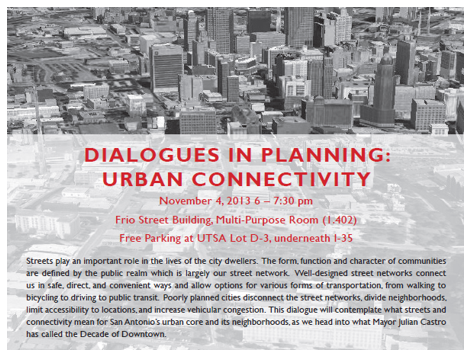 More information on the November 4, 2013 event is available through UTSA's Dialogues In Planning: Urban Connectivity Flyer. Read All About It! 2012 Growth Conference! On November 9, 2012, imagineSanAntonio hosted the 2012 iSA Conference on Growth, "Growing For The Future."